I went to Baskin-Robbins fully intending to try their new Trick OREO Treat Dark ice cream today but as (somewhat) expected, they didn't have it in yet. So, to be a thorough reviewer, let's try the original version first so I have something to compare the dark version to next week. I can sum this flavor up pretty easily. 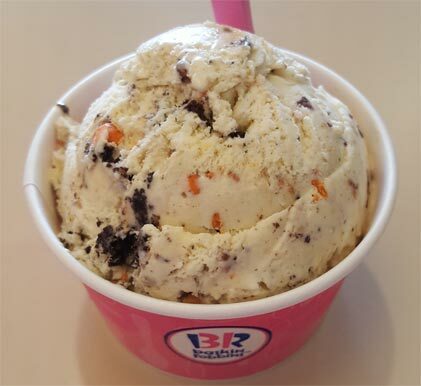 It's basically a mild Butterfinger cookies & cream ice cream. No one flavor truly stands out but for the most part it is a pleasant experience. I say it that way because I do not like the Baby Ruth pieces at all. I only had two of them and that was two too many. They are basically little hard landmines waiting to ruin your chewing experience. That's all I got because it tastes pretty much as expected short of the Baby Ruth bits. It doesn't dazzle but it delivers a nice snack. I say try it anyway if it strikes your fancy. Me, I'll be hoping for a straight Butterfinger Oreo flavor to come out.... as we see Butterfinger Oreos next year. I like the chocolate version better. I had the chocolate version tonight and it really was nothing special in my opinion. The Baby Ruth pieces were definite landmines (I had one huge one that I had to spit out, because it was simply too hard to chew). 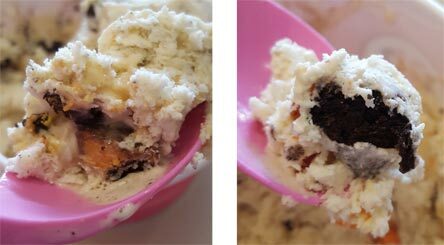 There was maybe a slight butterfinger vibe, but otherwise played off more as a chocolate cookies and cream. Glad I tried it, but probably a one off for me. Thanks for all the thoughts Eric. I was denied again this week but hopefully next week I will finally get to try it. Hope my scoop has more butterfingers in it!